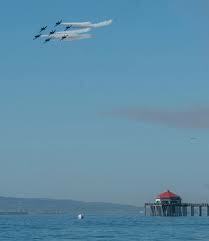 Come on out to Huntington Beach on Saturday, October 20th for the Air Show. We will be meeting by Life Guard Tower 5 on the beach, which is pretty much right across Pacific Cost Highway from Pacific City Shopping Center, which is the address listed on this web page so this at least gives you a reference point. The Air Show starts at 12pm but please try to get there at 11am so we can secure a nice area for alumni and friends. We will be waiving the Illini Flag as well so this should also help you find our location. Feel fee to bring food, drinks and your own chairs for the show. Bring alcohol at your own risk as security may be pretty strict about no alcohol on the beach and you could risk a fine or arrest. Parking at the beach will probably be $20. The event is free but please RSVP so we can have an idea of how much area to try and block off for our group. Please contact Jerry Clarke if you have any questions at jerryc1914@verizon.net or 714-319-7956.